Juxtaposition is one of my favorite words. Juxtaposition is “the fact of two things being seen or placed close together with contrasting effect.” That leaves the photography door wide open when it comes to possibilities. I could use a photo of today’s high in Phoenix (71 F or 80 while I was there earlier in the week) with today’s high in the Chicago area (21 but with fiercely blowing winds and wind chill advisories.) That would be chilling juxtaposition! Instead, I’m showing the juxtaposition of the graceful, smooth, luminous glass sculpture of Dale Chihuly juxtaposed against the straight, sharp spines of the surrounding cacti. 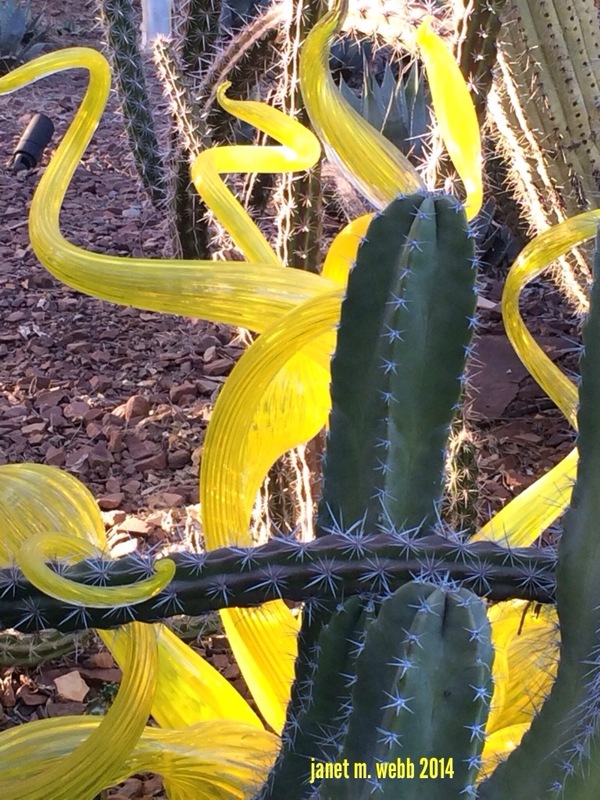 I love Chihuly’s work and the Desert Botanical Garden in Phoenix mounted a fabulous, lush installation of his work set against (juxtaposed) against the spare beauty of desert plants. I was fortunate to see it both during the day and at night, when his work was illuminated, material for further posts. Raewyn, the exhibit was wonderful and to be able to see it both in the daylight and at night was a bonus. No photo can do justice to his work, unfortunately. I saw his work in Kew Gardens some years back and several other places earlier. Love the photo! Beautiful cactus and sculpture. We’re having a weather juxtaposition as well… The high today is 35, but on Sunday will be 73! Have a great day and week-end! Lots of my friends in the south are saying how cold it is and for you guys, used to warmer weather, the contrast is probably worse, at least mentally. 🙂 Be thankful you don’t have snow with it. Enjoy your weekend, too. I saw his work, at least some of it, at Kew! Amazing stuff. Perfect choice! Beautiful photo, Janet! Great one! I love Dale Chihuly’s art work. Very interesting setting. To see his work in a desert setting is truly unique. To see it anywhere is wonderful! BRILLIANT, Janet! – this will set the standard! Nice of you to say so, but there are some excellent photographers in this group. Hope your day’s going well. Any plans for the weekend? I think here we’ll just try to stay warm! Gorgeous shot, Janet! It caught my eye. Hey, that looks like a Chihuly, I thought to myself! The glass and the cacti look like they are dancing. You really captured the spirit. Did you take any more photographs at the the Desert Botanical Garden? I’m off now to check out the website. Great work! T.
I took many, many shots, Theadora, and could have taken plenty more. I posted three on Tuesday (https://sustainabilitea.wordpress.com/2014/01/21/tantalizing-tuesday/) and will be posting lots more when I have time to organize and get some background information to go with them. It was a fabulous exhibit, but I’ve never seen anything of his that wasn’t. I thought this shot was perfect for the week’s theme. Ah, thanks for the link! I agree. It’s the perfect photograph for the week’s theme. The colors really pop! T.
Thanks for commenting my picture. Thought, I wasn’t here a long time so I came back and what I see, I haven’t seen before. That’s very, very beautiful and perfect for this theme. Thanks so much. I’m glad you could stop by. A brilliant take on the prompt Janet, exactly what they were looking for, I suspect. Well done. Good morning, Sandra. Thanks a lot. The entire installation was a gorgeous exercise in juxtaposition. Have a wonderful weekend. Tis is such a beautiful interpretation of the theme. It seems so strange to see Chihuly glass with thorny cacti behind it. Where in the world?? The Desert Botanical Garden in Phoenix, Arizona. It was a stunning installation. Beautiful Interpretation!!! Going to the Botanical Gardens in early February. Looking forward to seeing Chihuly’s work. If you have the time, go late enough in the day that you can see everything when it’s light, then go back and see it all again when illuminated. Both are wonderful but to have the contrast is the best. Quite an interesting set up! Great choice Janet, but then how can you go wrong when Chihuly is in the picture! Love his work, can’t imagine how wonderful it would be to see it beside the desert. My neighbor’s son studied with him and is a wonderful glassmaker too – their home is filled with glorious glass. What a privilege to study with him, although I bet it was hard work!! I first saw Chihuly’s work in, of all places, the Akron Museum of Art in Akron, Ohio. Since then, I’ve seen an installation in Kew Garden, London and a few “odds and ends” in other places. His work is distinctive and beautiful.